Representing the letter Y is a group from the magickal Pacific Rim country of Japan. 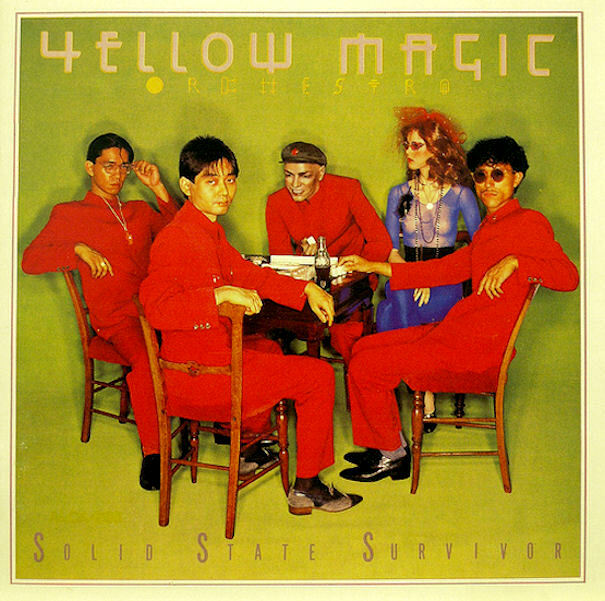 Yellow Magic Orchestra is a Japanese techno-art-pop group. They are highly innovative & influencial in the world of electronics, similar to Kraftwerk. The band was formed in 1978 by Ryuichi Sakamoto collaborating with drummer Yukihiro Takahashi, who had previously worked with the art rock group The Sadistic Mika Band & bassist Haroumi Hosono, who had already released four solo albums & was a well known producer. The initial concept was to set high tech Kraftwerk type arrangements to the sort of exotic faux orientalism of Martin Denny. It was originally supposed to be a sort of experimental one-off project, but after the success they encountered they decided to continue, getting together a full band, touring & doing more albums. Solid State Survivor is their second album, following quickly at the heels of the first self-titled release. It was not released intact in the U.S. until the Restless CD in the 1992. Some of its contents wound up on the US LP X∞ Multiplies but three tracks never came out in the US on LP. Although Yellow Magic Orchestra is considered more a synthpop band, they never dropped their original Prog sophistication. The musick on this album is fantastic, beginning with “Technopolis” which was written by Sakamoto. Probably the most well known song is “Rydeen” which was written by Yukihiro Takahashi. The title song “Solid State Survivor” features guest guitarist Makoto Ayukawa of Sheena & the Rokkets fame. The lyrics are by Chris Mosdell & all three YMO members do vocal work. I'm amazed that this was released in 1979. It sounds very fresh, and I never would have guessed that it's over 30 years old. I see that you're almost finished with the alphabet. I can't wait to see what you have in store to finish things off. Thank you very much, I wanted to discover the music of this band.